Enjoy the peace and satisfaction of clean, pure air with the Envion FS200 Four Seasons Air Purifier, Heater, Fan & Humidifier. Combining true HEPA filtration and unique, powerful engineering, this one-of-a kind product features a heater, humidifier, fan and air purifier - all built into one space-saving machine, so your family can enjoy the warmth of an adjustable electric heater without drying out your skin or the air around you. With 3 heat settings, this electric air cleaner generates healthy, moist heat, or a clean cool breeze in medium to large rooms. The True HEPA filter removes mold, mildew, smoke, viruses, germs and pet dander. This is the perfect product to keep your home pure and comfortable all year long! When it's allergy season, you can trust the Four Season air purifier to remove common allergens, pet dander, any much more from the air in your home. In warmer months, set your Four Seasons to its powerful fan mode for a cool, refreshing breeze. As the season starts to turn and a chill fills the air, use the heater setting on your Four Seasons to warm your home. The Four Seasons comes equipped with a heater and humidifier, so you won't feel dry even if your furnace is working overtime. PET DANDER: Dogs and cats bring odors and germs from outdoors into the house. They also release airborne dander, a known allergen, from their hair and skin. COMMON ALLERGENS: Hay fever caused by pollen particles in the air in spring and fall can cause irritation to the eyes and could lead to asthma or respiratory problems in susceptible adults and children. GERMS and VIRUSES: A sick person does not need to be coughing or sneezing to get you sick. Airborne flu and other viruses float throughout the air just through normal breathing. MOLD SPORES, MILDEW AND BACTERIA: All of these thrive in damp and humid areas, such as bathrooms, kitchens and laundry rooms. They can cause severe breathing difficulties if inhaled. 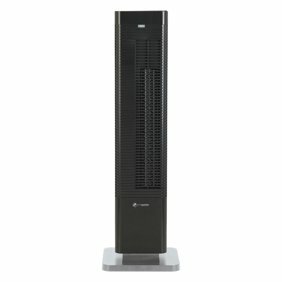 Take a look at other Envion Air Purifiers for all your air cleaning, purifying, detoxification needs at www.envionproducts.com. The Envion FS200 Four Seasons Air Purifier, Heater, Fan & Humidifier is an amazing item. Not only does it save you money by only needing to purchase 1 appliance vs. 4 ... BUT ... it has low power consumption because it's ENERGY STAR Certified. It will also saves valuable space in your closet because you won't need to store 3 appliances in the off season. It has a sleek compact design and barely makes any noise when in use. Why I love the Envion FS200: Super simple to use * It's an Air Purifier, Heater, Fan and Humidifier all in one making it a must have for Condo and Apartment dwellers that don't have a lot of storage* You can use dual functions at one time, so if you need to warm a room but don't want to dry out the air, just water and it will humidify as well * Each function works great alone! * The Air Purifier is a true HEPA filer which captures 99.97% of the particles as small as .03 microns. This can help everyone!!! It can remove impurities like in the air like: Airborne Flu and viruses, smoke from wild fires, mold spores, mildew as well as pet dander making this perfect for people with common allegories like hay fever or pollen. Over all, this is a great multi function unit that EVERYONE can use. It has 4 products rolled into it and the Air Purifier along is work the price. It's quite, compact, allowing you to use more than 1 function at a time. You'll save money by not having to purchase multi items and it's ENERGY STAR certified. I am writing this review as part of a contest. 4 Seasons of Good Weather in my House! Perfect year round device I can keep around all year long. I love this multi-functional heater/fan and humidifier. It's quiet, doubles as a humidifier and also works as a fan. I like how it oscillates so it can transfer the heat in the space. I have a vornado at home and this heater is just as easy to use. I like how this multi-functional heater is black because it just matches everything in my house - no matter what style you have! This really is 4 appliances in 1 item! This one item has different modes that can be used as a Heater, Fan, Air Purifier and Humidifier. It does seem high in price but if you do the math it saves you a lot of money compared to buying 4 separate appliances with all these functions. What I love most about this item is that I don't need to store 4 appliances in my house and then spend the money to buy all of them. This is a high quality item from a trusted brand that can be used year round. So you can just keep this one item out all the time without having to store it b/c you will always have a need for it. In the Spring and Fall, the Air Purifier mode will help clean the air to remove allergens, pet dander, germs, viruses, etc.. In the Summer, the Fan is powerful enough to keep you cool. In the Winter, the Heater and Humidifier will keep you warm and you won't get the dry heat. This is light weight and has a grip on top so it's very portable and easy to move around. There is an indicator that will turn red to show you if you need to "Refill" the water. It's very versatile so it can be used in small to larger size rooms. It's also very easy to use. There are 3 fan speed modes, 3 function modes for Heater, Humidifer or Fan & Air Purifier, 3 levels of heating temperatures and then a push button to turn on/off. The back of the appliance has a True HEPA type filter that is easy to see and replace. I took pictures of top and back so you can also see this item from all the other angles. Not only is this item very practical and functional, it also looks good and doesn't take up too much space. Well worth the money! I am writing this review as part of a contest. I researched a lot of air purifiers before purchasing. This unit is wonderful! Love all the functions and works very well in each mode. I also love that the humidifier puts just enough moisture into the air. Thinking of purchasing a second one. The best product for every season! This product is everything I could have asked for in a heating/cooling fan! This item's all-in-one features fits every environment throughout the year. I've kept it in the living room all year round. From cold winters to hot summers and even dry days, I can always count on this heater, fan, and humidifier to provide the best comfort. Especially during the recent wildfires, I didn't have to rush to buy a separate purifier like everyone else, since this item already has one built in. I highly recommend this product to anyone, who is tired of purchasing a variety of fans/heaters/purifiers/humidifiers that clutter up your living space only to be used for a limited time each year. I am writing this review as part of a contest. This is such a cheap item that really does it all! I'm so pleased with my purchase, I don't think many products have the capabilities this product does, with the speed and ease. The user interface is simple and the product is sturdy so I know it won't break when I hit it by accident with my crazy dance moves. I didn't know products like these existed, and I was honestly skeptical of purchasing it. After using it, all 4 features (dehumidifier, fan, air purifier and heater) work great! This is something I am definitely going to recommend to my friends. I am writing this review as part of a contest. Fits All My Needs in one Great Product! This (I'm not even sure what to call it) Humidifier, or Purifier, or Heater, or Fan, is exactly what I was looking for and is a great addition for any room. I use this in my bedroom, which doesn't get too stuffy, but the purifier and humidifier combo is perfect for me. While there are definitely better quality purifiers and humidifiers on the market, the fact that this has all 4 functions makes this so much more useful and cost effective. I live in San Francisco so I don't have extreme seasons, and the heater function is perfect for my small room on cold days, while the fan circulates the air on hot days. I would highly recommend this product to anyone, and I have not seen a better 4-1 product in the market. I am writing this review as part of a contest. The Envion FS200 Four Seasons is perfect for year round usage! Perfect for cold winter nights and even better for hot summer days! It has an automatic shut off when it is tilted too far to prevent any sort of accident! The fun doesn't stop there! It is also a humidifier! This will be a keeper in my home for years! I am writing this review as part of a contest.